booked this hotel as near Airport & has free shuttle.... wish I stayed more than those 1 night. Great hotel, great shopping in easy mall walking distance & will definitely stay again for longer to take full advantage of hotel facilities. Great room and staff very helpful and friendly. Excellent location for Retiro and Atocha. Rooms in popular neighbourhood. Nice plaza, very central for walks. 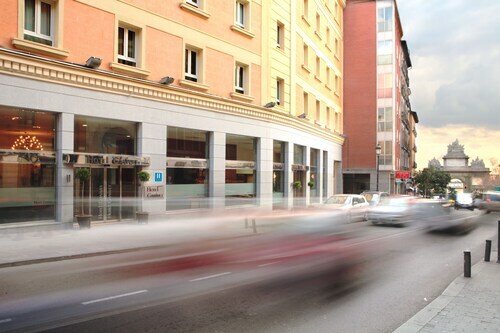 Good hotel walking distance from terminal 2 or 3 at Madrid airport, staff always helpful. Great staff, extremely helpful and friendly! Room cleaned so well when we were out. Towels replaced regularly. Cannot complain about this place at all. Great central location. So, you're thinking about going to Madrid? If you'd like to find accommodation that's within a stone's throw of the sights, you can enter your holiday dates and then use the filters beside your hotel search results to find somewhere to stay near the area's attractions such as Plaza Mayor, Prado Museum and Thyssen-Bornemisza Museum. 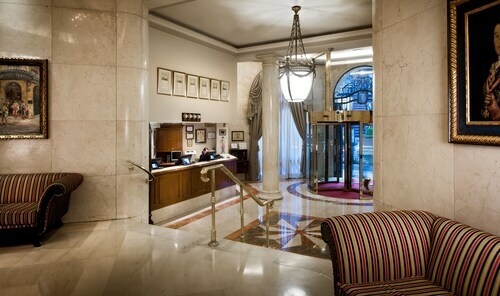 You can choose among 2435 Madrid hotels and accommodation choices to find a place you'd like to stay. 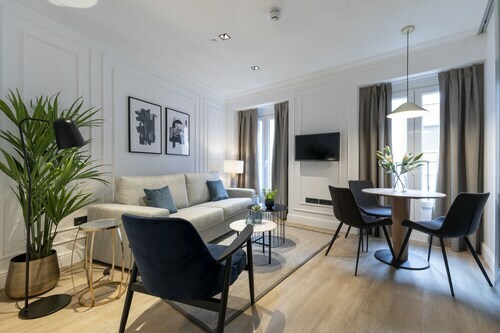 When you're thinking about where you want to stay in Madrid, you can easily and quickly search ebookers for hotels offering services such as high-speed Internet, a swimming pool or free airport transport. 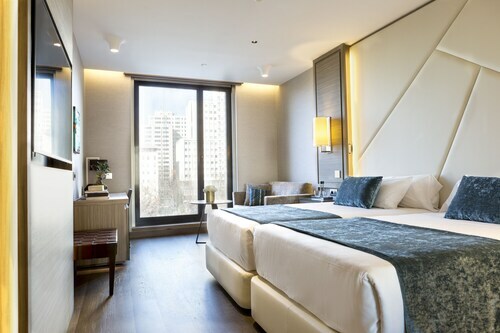 You can take advantage of the filters to narrow down your search for accommodation, so you can get the services that are important to you, such as an in-room kitchen or air conditioning. 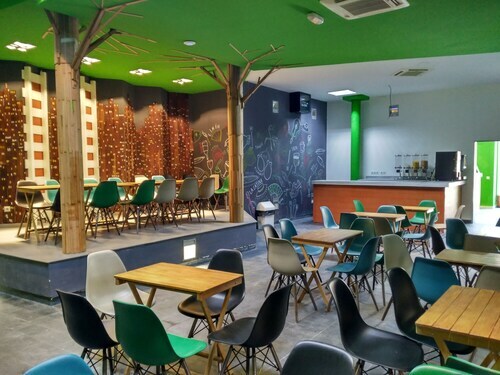 When making plans for your trip to Madrid, you can also use ebookers to find a convenient flight into Madrid (MAD-Adolfo Suarez Madrid-Barajas) Airport. You can narrow down your search by number of stops, airline or time of departure to find the one that'll meet your needs. 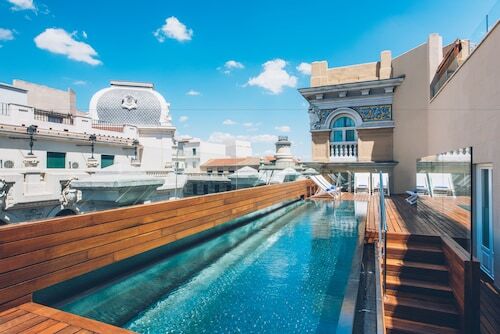 When is the Best Time to Explore Madrid? If you're curious when is the best time of year to travel to Madrid, you may find this information about seasonal weather helpful when you are organising your getaway. The warmest months in Madrid are typically July and August, whereas the coldest months are usually January and February. The months with the most rain are August and June, whereas January and February have the least. From January to March, the average daytime temperature is 16°C and at night it is 1°C. Seasonal average rainfall is 4 mm. If you visit between April and June, you can expect an average temp of 30°C during the day and 5°C at night. Average rainfall during this season is 9 mm. The daytime average temp from July to September is 32°C and the nighttime average is 11°C. Average precipitation for this season is 10 mm. Between October and December, the average temp during the day is 23°C and 1°C at night. Seasonal average rain is 6 mm. Average annual rainfall in Madrid is 29 mm. This hotel is one of the best we have ever stayed in. Not only was it exceptionally clean and well maintained but the service was superb as was the location. We could walk into the city centre in 15 minutes or take the metro which was 150 metres away. Nothing was too much trouble and if we ever return to Madrid we shall definitely stay there again. 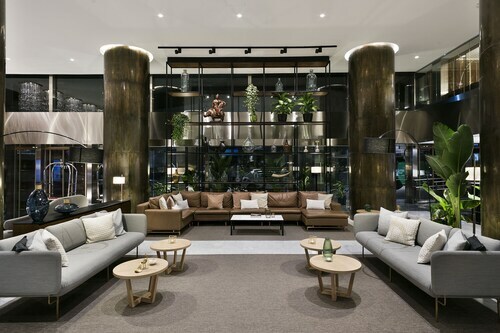 Amazing apartment. Very clean and beautifully furnished, and well located. The kitchen is well equipped and cleaning products are supplied. A very well illustrated user guide is provided for the various tech items such as the air con, door lock mechanism etc Staff (at the sister hotel) are very friendly and offered to bring essential items across to us if we ran short (toilet rolls etc). Highly recommend this fantastic apartment. Die beste Unterkunft in Madrid! Top! Das Personal ist sehr Hilfsbereit und die Lage des Hotels sehr Zentral. worth every star. location, service, food, concierge, bell captains, beds, fitness, spa, household service, check-in, check-out, great time. I was charged by Ebookers for this booking, then arrived to the property and they told me I had to pay for my booking there. So I paid twice, wrote to reception staff about 10 days ago and even did not get an answer from them !!! Sehr helle und freundliche Unterkunft. Duvet und Kissen keine Daunen. Lichtregulierung etwas schwierig, nicht individuell steuerbar.